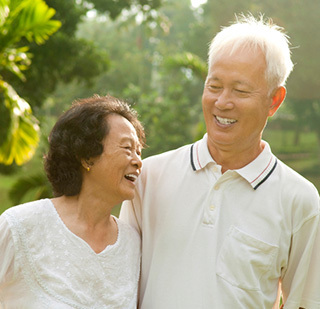 When you learn about implant-supported permanent dentures from Englewood, OH dentists Drs. Dominic and Louis Vitangeli, you may very well begin to think differently about dentures. With a few dental implants in place, your permanent dentures become extremely stable, which is necessary to eat comfortably and smile with confidence. Dayton area denture patients may be craving a better experience. You can find it with the remarkable ease and effectiveness of implant-supported permanent dentures in Dayton. This procedure starts with a few dental implants which are surgically placed into the jawbone. This may seem extreme, but our Englewood dentures patients with implant-supported permanent dentures will assure you that the vast improvement in fit and stability is worth it! We offer high-end customizable dentures. Each denture apparatus is custom made to fit your smile perfectly. The denture will look completely natural. Our dentures are individually crafted to replicate the teeth you’ve been missing. We care about your unique smile goals and will craft our dentures to meet your specifications. Get your photo snapped, smile and laugh with confidence again. The denture will feel natural. You may even forget you have a denture appliance in your mouth! We place and restore dental implants so your whole denture treatment can be done under one roof–with dentists and a dental team you know and trust. We have a CT scanner and a surgical guide to pinpoint the ideal location and angle of the implant so your dental implants are placed exactly where they need to be. After your implant post heals, you will return for the final restoration of the implant–a dental crown. Once this is in place, you have the foundation for a steady denture, perfectly fitted for you by Dr. Vitangeli. Implant-supported permanent dentures will also help you retain jaw bone structure, which can diminish without implants. Discover the many advantages of implant-supported permanent dentures from Dayton cosmetic dentist Dr. Vitangeli. Call for your consultation today.